For food safety outdoors, the USDA recommends keeping hot foods hot and cold foods cold. When camping in hot weather, this may not be possible. 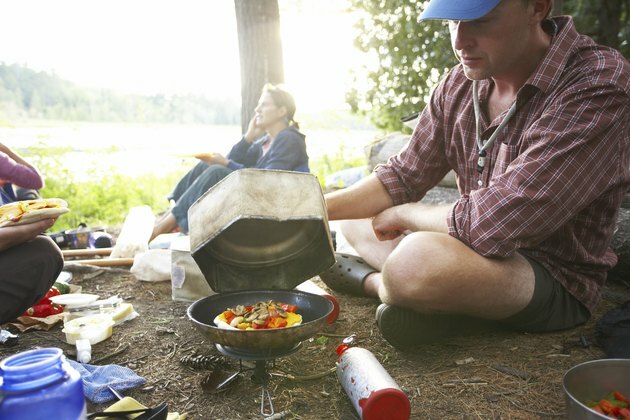 There are, however, plenty of foods to eat while camping that don't have to be kept warm or on ice. If you're backpacking you'll have to get more creative with a few lightweight, non-perishable staple foods. 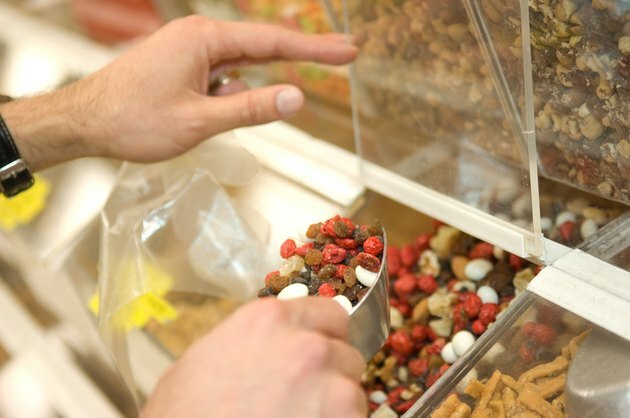 Instead of prepackaged trail mix, consider a trip to your health food store's bulk section to mix and match your own nuts, seeds and dried fruit. Choose from roasted or raw almonds, sunflower seeds, cashews, pumpkin seeds, walnuts and brazil nuts. Look for flavored nuts such as curried cashews, tamari almonds or spicy pumpkin seeds. For dried fruit go beyond raisins–try dried cranberries, apricots, cherries, figs, apples, banana chips and coconut shreds. Nut butters keep well and can provide a quick energy boost. They can also add substance, protein and calories to soup or chili. In addition to peanut butter try almond butter, cashew butter, sunflower butter or walnut butter. Also look for individual packets of nut butter, a portion-controlled snack–perfect for survival kits and day hikes. Freeze-dried foods are lightweight and have a long shelf life. To prepare, pour boiling water right into the pouch and wait a few minutes. You can even eat most of these meals right out of the container. Options include vegetable lasagna, Polynesian chicken, pasta primavera, scrambled eggs and breakfast skillet. Desserts such as freeze-dried ice cream and blueberry cheesecake are also available. Because of their long shelf life, freeze dried foods make a great addition to your survival kit. 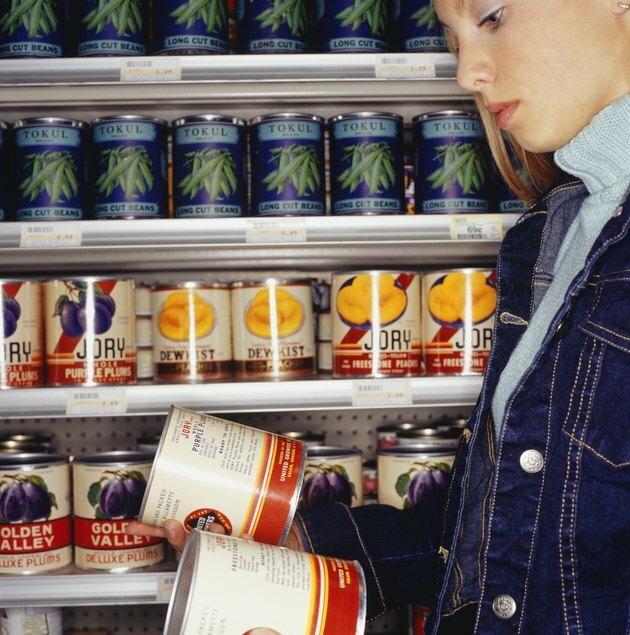 Tuna, sardines and salmon are widely available in both cans and foil pouches. Also look for salmon chowder sold in foil packs. For more variety, include cans of smoked oysters or clams. Fish are an easy way to boost the protein content of your camp meals. 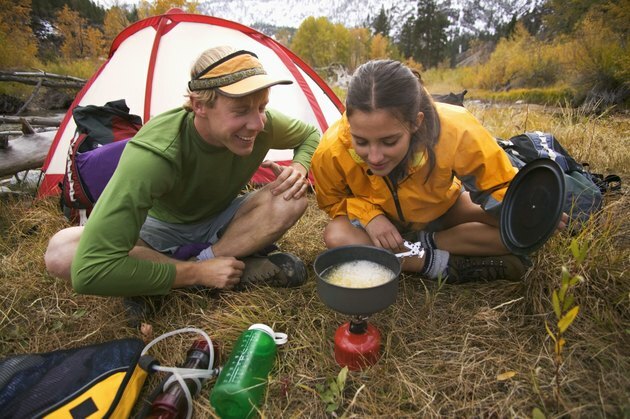 If you plan to cook on your camping trip, you have several easy-to-pack options: thin pasta, quick-cooking rice, potato flakes, oatmeal, hot cereal and any instant packaged food that requires boiling water. To get more creative in your camp kitchen, pack cooking oil, onion, garlic and spices. Corn on the cob and whole potatoes also pack well–and they can be cooked right in a campfire. You may also want to pack tea, coffee or powdered cider. If you can take the weight, cans are a great option. Consider packing canned beans, tuna, chili, soup, lentils, vegetables and fruit. Foods sold in foil packs are as easy to take camping as canned foods, and they will add variety to your meals. They also weigh less. Look for Indian food, rice pilafs, bean dishes and fish. Eat these foods right out of the pouch or mix with pasta, rice, potatoes or canned chicken. 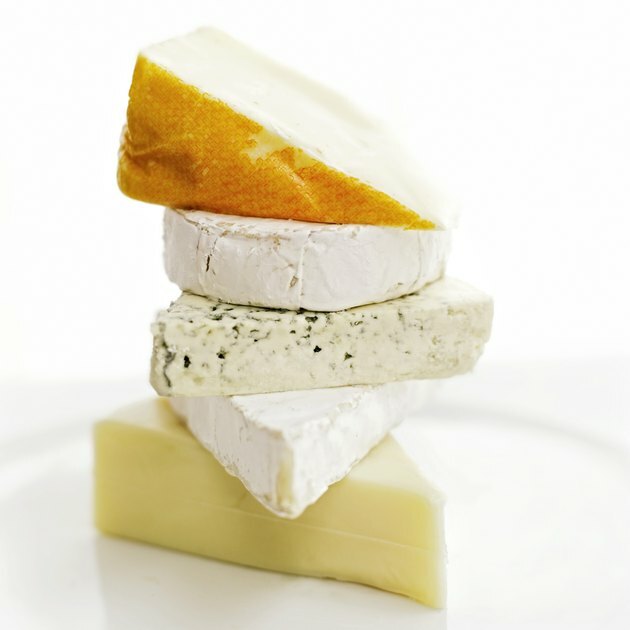 To keep cheese edible beyond a few days, wrap it in cheesecloth soaked in vinegar. The cheesecloth soaks up extra moisture, and the vinegar combats mold, according to Canoe & Kayak Magazine. If the cheese does get moldy, you can cut out the moldy parts, just as you would at home. If it is warm out, the oil may separate, but this is not a problem, says Canoe & Kayak Magazine. 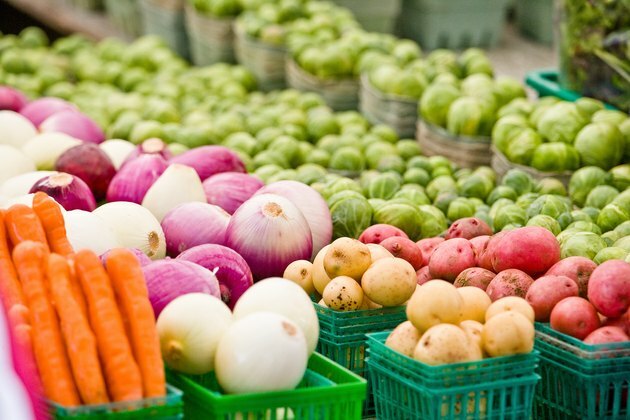 Many people might like an excuse not to take fresh vegetables, but if you're one of those people who rely on a daily dose of fresh produce, don't despair. Carrots, beets, parsnips, jicama, potatoes, onions, garlic, apples, unripe avocado, lychee nuts and oranges all pack well.